The Nerite snail is a hardy roundish snail with variable markings, that make it an attractive addition to the reef or saltwater tank. Nerites will consume diatoms, film algae, finer hair algae species, and many species of cyanobacteria - including Lyngbya. These snails are excellent for cleaning the rocks and glass of your aquarium, and are 100% reef safe. They will not consume most display macroalgae, Ulva species are a notable exception though. We carry both Nerita fulgurans and Nerita tesselata under this product listing. The nerites we ship usually range from about the size of a nickel in diameter, to about the size of a quarter in diameter. 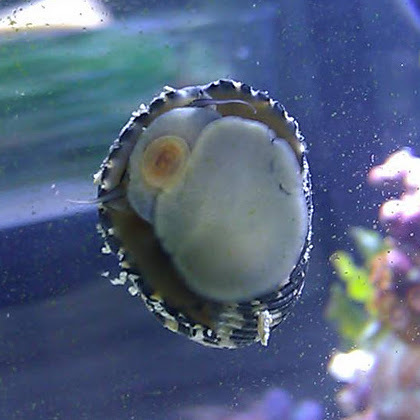 Nerites have a tendency to want to climb out of the water when first added to the aquarium. They should be kept in tanks with lids, or with thick lips on the rim of the tank. This will keep them in and cleaning. Usually after a period of a week they learn their new boundaries pretty well. If they get out before then you can place them back in the tank, they carry water with them in their shell which enables them to breathe if they go above the water line. These Nerites are not suitable for freshwater tanks.